Comtesse de Verrue; (+) sale, Paris, April 1737, lot 12 (with its pendant). Anon. Sale, Hôtel Drouot, Paris, June 19, 1964, with its pendant. Anon. Sale, Hôtel Galliéra, June 22, 1965, lot 71. Anon. Sale, Sotheby's, Monaco, Nov. 29, 1986, lot 348. C. Blanc, Le Trésor de la curiosité, tiré des catalogues de vente de tableaux, dessins, estampes, livres..., 1857, I, p. 11, no. 13. H. Mireur, Dictionnaire des ventes d'art faites en France et à l'étranger pendant les XVIIIème et XIXème siècles, VII, 1912, p. 405. Mlle. Bataille, Vleughels, Les peintres français du XVIIIème siècle, sous la direction de Louis Dimier, 1928, I, p. 258, no. 57. E. Bénézit, Dictionnaire critique et documentaire des Peintres, Sculpteurs, Dessinateurs et Graveurs de tous les temps et de tous les pays, VIII, 1966, p. 602. M. Rambaud, Documents du Minutier Central concernant l'histoire de l'art, 1700-1750, Archives nationales, Paris, 1971, II, p. 890. P. Rosenberg, A propos de Nicolas Vleughels, Pantheon, XXX1/2, 1973, p. 148, fig. 8 and pp. 144 and 145 (note 10). B. Hercenberg, Nicolas Vleughels: Peintre et Directeur de l'Académie de France à Rome 1668-1737, 1975, pp. 85-6, fig. 88. The principal account of the adventures of Telemachus is Homer's Odyssey; however, the source that Vleughels and other 18th-century artists turned to was the popular romance -- Les Aventures de Telemaque -- by the French writer Fénelon, published anonymously in 1699. In Fénelon's story, Telemachus, son of Ulysses and Penelope, sets off in search of his father, who has failed to return home after the end of the Trojan War. He is accompanied on his journey by Minerva, a goddess of Wisdom and guardian of heroes, who disguises herself as his old teacher, Mentor. The travellers are shipwrecked on the island of the goddess Calypso, where Ulysses had earlier been imprisoned. Calypso falls in love with the beautiful youth and detains him by persuading him to recount his previous adventures. 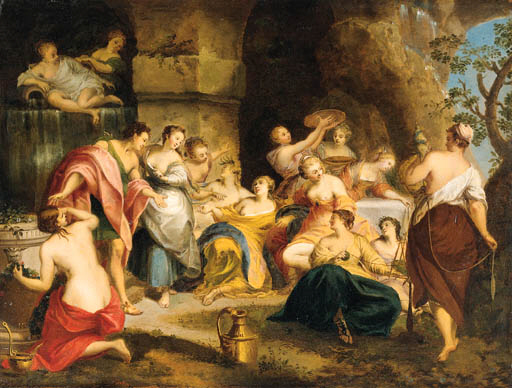 In Vleughels' depiction of the tale, a gesturing Telemachus relates his story to the goddess, who is seated in her grotto surrounded by nymphs. The painting originally had a pendant, Telemachus before Eucharis (private collection, Paris), which tells of the next installment of Fénelon's romance. To assist Calypso in winning the boy's heart, Venus sends Cupid to her aid; but it is too late, for Telemachus has already fallen in love with Eucharis, one of Calypso's nymphs. Cupid incites the other nymphs to burn the boat that Minerva had built for their escape, forcing Telemachus to leap into the sea, where he and Mentor are saved by a passing ship. A painting from Charles Natoire's series Telemachus and Calypso (1739-40; the Hermitage, St. Petersburg), depicts the burning of Telemachus' vessel. Vleughels' painting and its pendant were among eleven works by the artist owned by the eccentric collector, the Comtesse de Verrue (1670-1736), who was also a patroness of Vleughels' close friend, Antoine Watteau: the pictures are recorded in her inventaire après décès. The Comtesse de Verrue's pronounced taste for Dutch and Flemish art no doubt stimulated her interest in the works of both Vleughels and Watteau, who shared a Flemish heritage and were equally influenced by the colorisms of Rubens and Veronese. From 1719-21, the Comtesse acquired five houses on the rue du Cherche-Midi, and began a sumptuous program of decorating her new hôtel; the date of 1722 that is inscribed on Telemachus before Eucharis, pendant to the present painting, suggests that this pair of mythologies was created as part of the new decor. The fact that Fénelon's book, though first published in 1699, had been banned in France until 1717, no doubt also lent a racy immediacy to the subject which would have appealed to the enlightened patroness, who was known as 'La Dame de Volupté'. The sinuous, rhythmic interlacing of the figures in the painting is characteristic of Vleughels' mature style, as is the warm Rubensian palette. A trois crayons study for the seated woman winding wool on a frame is in the Comte d'Orsay collection at the Louvre. Its technique very closely resembles that of Watteau, who had died the previous year. Likewise, the kneeling nymph at the upper left who represents 'la Source' is reminiscent of several of the statues that appear in Watteau's later fêtes galantes, in particular the sculpture in Divertissements Champêtres (c. 1720; the Wallace Collection, London).